The problems we see all around us often seem overwhelming. Many people I know feel that the world is heading in an irreversible negative direction. Pete Seeger didn’t believe that for a moment. His life was a demonstration of his conviction that we can make a difference against negativity in the world. The songs he wrote were always about the message and never about him, whether they were performed by him; the Byrds; Peter, Paul, and Mary; or U2. The work he did personally year after year to draw attention to critical issues, including the deteriorating conditions of the Hudson River, had profound positive results. 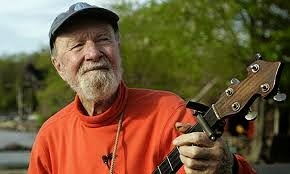 I grew up on Pete Seeger songs. They shaped my views of war, the environment, and the importance of using whatever gifts you have for the betterment of our planet. As an ardent participant in his Clearwater initiatives to educate kids and the public about the pollution of the Hudson River, I learned about peaceful but purposeful social activism. 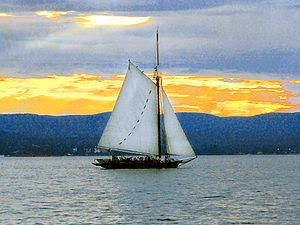 I am not sure my life, my work, my love of sailing, and my most recent book, HUM, would be so clearly focused on purpose and harmony if Pete Seeger had not lived. Yesterday I shared with my Facebook friends the (true) story of how, years after working with Seeger on his Clearwater initiative, a friend and I found ourselves at the head of the Carnegie Hall ticket office to purchase seats for a sold-out Pete Seeger-Arlo Guthrie concert at the precise moment they got a call directing them to sell additional seats on stage. We got the first two, which resulted in Pete turning to us for lyrics when he couldn’t think of them, as well as instructing us lead the men and women in two-part sing-alongs. At intermission, we were swamped with people telling us how much they were enjoying the concert, assuming that we were part of the “act,” rather than audience members who happened to buy our seats later than they did. What a hoot it was to be on stage with Pete Seeger at Carnegie Hall, even if it was a result of a confluence of fluky events! Pete Seeger embodied the spirit I describe in my book, HUM. He was always optimistic, self-effacing, creative, courageous, gentle, and driven to speak out and act to change the negative forces he observed. He lived his values, touching many lives like mine. My work to help people in organizations create connective change was shaped by what I learned from him about our relationship to others, our environment, and our highest selves. His spirit lives within me, as it most certainly does among thousands of others he touched. 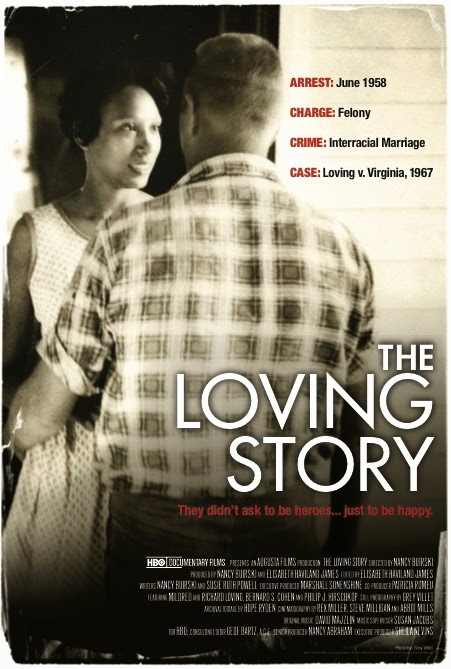 One of the things I did this week to celebrate MLK Day was to watch the deeply moving documentary, “The Loving Story,” which profiles Mildred and Richard Loving’s journey for justice here in Virginia. Arrested a few days after their 1958 wedding for breaking Virginia’s laws against interracial marriage, they were forced into years of exile from families and friends. Mildred wrote to Bobby Kennedy for help in returning home, and he wrote back suggesting she contact the ACLU, which she did. In 1967, the Supreme Court, led by Justice Earl Warren, heard their case when most expected it not to be considered. Changing the nation, the Court unanimously decided that the ban against interracial marriage was illegal. As a transplant to Virginia from the North, I was stunned by the fact that I was not watching ancient history. The state in which I live today argued in my lifetime that God intended different races to be separate, which is why He put them on different continents. Their argument was that it would go against God’s will to mix races when God had so clearly spoken his intent. In spite of the Supreme Court ruling in the Loving v. Virginia case, other Southern states continued to forbid interracial marriage. In 2000, Alabama became the last state to lift the ban on interracial marriage. “The Loving Story” is a great film to share with family members and encourage discussion of the history of racial segregation and interracial issues in our country and around the world. Its impact is made greater because it took place within our lifetime and in our own backyard. Richard and Mildred loved one another and just wanted to be able to live together as husband and wife. They weren’t looking for trouble or fame. The fact that they persevered is inspiring. The fact that they had to is shameful. Labels: interracial marriage, Loving Story, MLK Jr.
During this time of year when New Year’s resolutions are being tested, I have been thinking about one of the features of my work that I love the most. It is that I get to help clients start with what they’ve got and where they are. You have to acknowledge—and maybe even honor—your current reality before you can build it into what you’d like it to be. I don’t try to change who my clients are or deny the challenges they may be facing. In fact, I find it exciting to work with what you’ve got to create something beautiful and functional. I bring this same love of “solving” how to organize what exists into something greater when I prepare a meal from ingredients at hand. I call on it when I help a friend rearrange her furniture or her wardrobe for a fresh, new look. 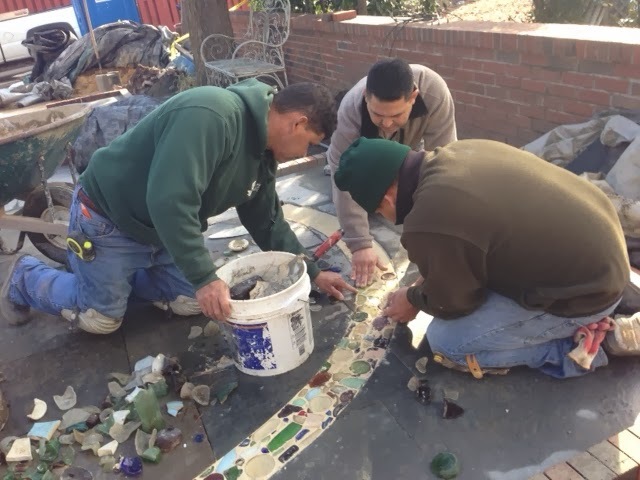 I call on it when my garden needs attention—why start all over when you can work with what you already have? This photo is of work being done on my patio now by rearranging the existing materials, including buckets of sea glass I had collected, which are now becoming a mosaic pattern weaving through the patio. For me, starting with what you have and where you are is a form of gratitude and being present. When I want to move in a new direction, either professionally or personally, I first feel the need to accept and even embrace what I have and use that as the foundation for change. Many people buy new equipment or instructional videos if they want to change something personal. Although these may be helpful once you have moved into the change, if done outside of the context of appreciating and using what you already know or have, they rarely create change. The change has to come from within. And, at least for me, it begins with gratitude for what I already have, know, and can do and builds from there. Think about how this applies to the organization or team you lead. Are you focused on what people are doing wrong, or on what you have to work with? Are you guilty of thinking that if you only had more staff, a different board/boss, or more authority you could achieve your vision? Your vision is waiting to be realized and its seed is already in your hands. It's a new year and, if you are like most Americans, you have put some thought recently into how you are going to improve yourself, develop better habits, rethink older habits, and resolve to make this a better and more productive year. As you go about your self-evaluations, I am going through the same interesting process with many of my clients. I have found that implementing the Schiller Center's Connective Strategic Leadership model in organizational clients helps my clients support the goals that they have set for the new year as well as prepare them to make adjustments to the inevitable challenges they will face along the way. In other words, I am trying to help my clients develop their potential. This is why I became intrigued with the work of Dr. James Heckman, who has also devoted his life's work to understanding how others develop their potential. Dr. Heckman is an expert in the economics of human development, focusing primarily on the importance of equal early childhood development. His work is fascinating and important for everyone, especially those with children, to read and understand. The implications are not only profound for local communities, but for the nation as a whole. As you plan for the year ahead, think about how you are going to develop your potential in 2014 and, perhaps more challenging, how you are going to help others develop their potential.